Your students will enjoy learning about the 3 Branches of the United States Government with this interactive packet. 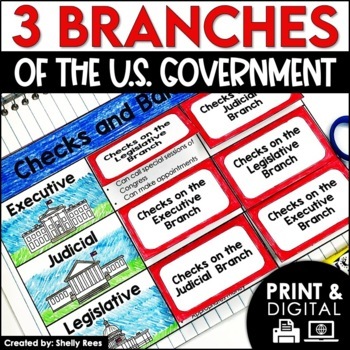 This hands-on approach to learning will surely help your students learn and understand all about the checks and balances of the Three Branches of the U.S. Government. Click HERE to SAVE 20% by buying ALL 15 Social Studies Interactive Notebooks and Mini Units in one Year-Long Bundle. 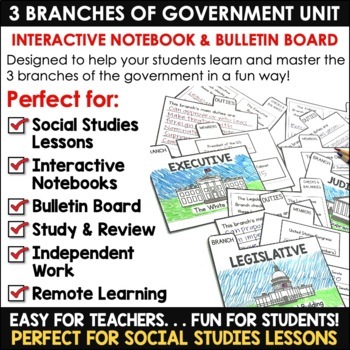 • Mini File Folders: These mini file folder foldables are perfect for helping your students discover the duties, members, and checks and balances of each of the 3 branches of government. Great for interactive notebooks! 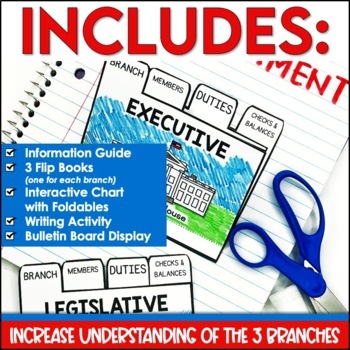 • Foldable Interactive Table: Students create an interactive table to explore and learn about the checks and balances of the 3 branches of government. This table is ideal for use in students' interactive notebooks. • Writing Activity: Students will use the provided application form to apply for a job in the government branch of their choice. A letter-writing template is also included for letters of application and interest. • Information Guide: This sheet in included for convenience in note-taking and foldable completion. • Bulletin Board Display: Includes bulletin board header, illustrated accent pieces, and photo directions. 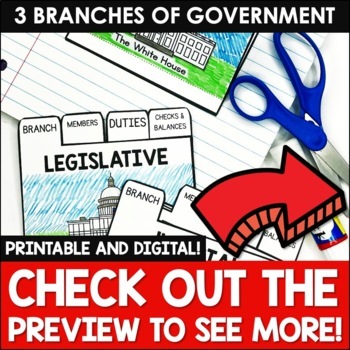 Use these pages to create a bulletin board with an informative display about the 3 branches of government. Add the students' job applications for an eye-catching bulletin board! The packet also includes a teacher-direction sheet with photo examples of the projects in use in the classroom. It is very clear and easy-to-use; basically just print and go! My students loved these activities; I think yours will, too! Don't forget that leaving feedback earns you points toward FREE TPT purchases. I love that feedback! Also, follow me and be notified when new products are uploaded. New products are always 50% off for the first 24 hours they are posted. It pays to follow me!